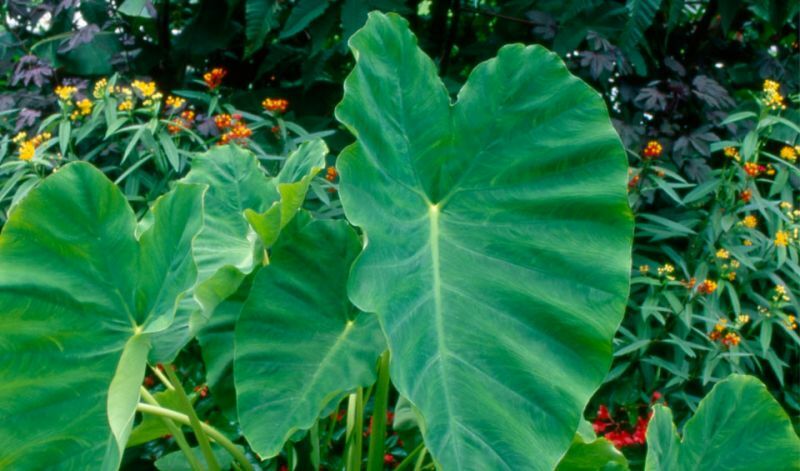 Colocasia produce large, green, heart-shaped rippled leaves that can grow up to 3 ft / 90 cm long and almost as wide (depending on the size of the tubers: the larger the tuber, the larger the leaves). They add a lush, dramatic, bold, tropical appearance to any garden, deck or landscape. In or along ponds, large flower beds and containers. (Besides species itself); 'Black Magic' (dark maroon). * PLANTING NOTE: Top of the tubers should be covered with 2" / 5 cm of soil. Adjust the planting dept according to the size of your tubers. Native to East Indies, tropical Asia and the Pacific Islands where it is mainly grown for its edible roots (they are called 'potato of the tropics' by some). It is believed to be one of the earliest cultivated plants.